Habitat selectivity and ecology of freshwater fishes were studied in two selected streams and their junction point which consist a total of 39 microhabitats. The aims of this study were to describe the habitat preference and its availability to fish assemblage, as well as ecology, habitat use, and habitat characteristics. We collected fish with backpack electrofishing three times during August 2013, December 2013, and March 2014. Using a variation partitioning approach of R software, we studied the relationship of fish abundances with stream type, habitat type, and abundance of key macroinvertebrate taxa. A total of 6554 fishes representing four species belonging to the family Cyprinidae were caught. A higher total fish abundance was recorded from Gereb Tsedo (4870; 74.3%) than from Elala stream (1684; 25.7%). Taking both streams together, the overall total relative fish abundance was significantly higher in pools (53%) than in runs (35%) and in riffles (12%) at P < 0.05. Species-wise comparisons showed that 71%, 15%, 13%, and 1% of the pool fish community were occupied by Garra blanfordii, Garra ignestii, Garra dembecha, and Garra aethiopica, respectively. Stream type, habitat type, and key macroinvertebrate taxa each explained a significant proportion of the variation in fish abundance. 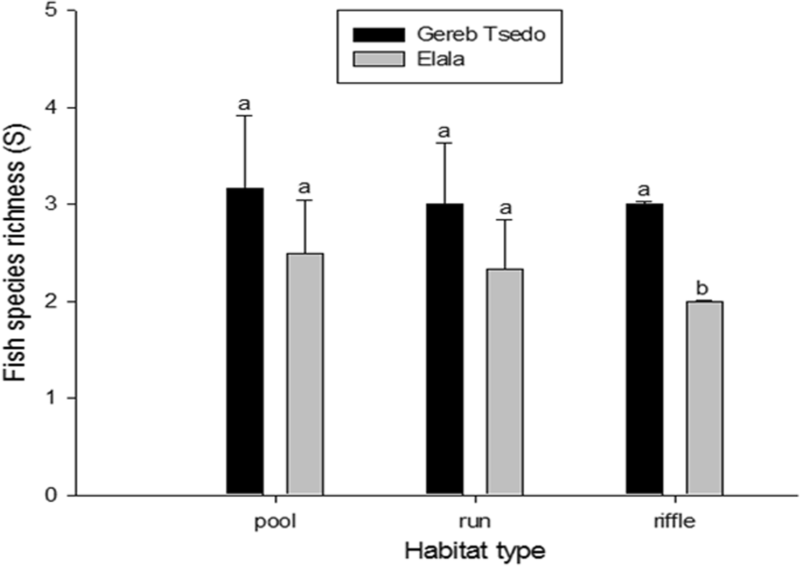 Based on the variation partitioning approach, fish abundance was higher in Gereb Tsedo stream (P < 0.01). Moreover, fish abundance increased with pool habitat type (P < 0.01) and with availability of key macroinvertebrate taxa (P < 0.01). Fish abundance differed between stream types, among habitats and among key macroinvertebrate taxa availability. Among the factors, habitat type was the most important driving factor behind variation among fish abundances, and pool supports the highest fish abundance. Habitat provides the medium in which fishes may flourish or die. Its physical structure is of greatest importance in determining both the abundance and species composition of stream fishes (Gorman and Karr 1978; Rose and Echelle 1981; Finger 1982). Important aspects of habitat structure include water depth (Mendelson 1975; Baker and Ross 1981; Meffe and Sheldon 1988), water velocity and flow (Schlosser 1985; Schlosser and Ebel, 1989), cover (Rakocinski 1988), and substratum composition (Gorman and Karr 1978; Rose and Echelle 1981). Commonly, these variables are intercorrelated so that habitats may be separated into discrete classes. In small streams, sharp discontinuities often exist between channel geomorphic units giving rise to the characteristic pool and riffle sequence (Hawkins et al. 1993). Fish use different habitats at different stages of their lifetime. Therefore, understanding the ecological relationship between fish and their habitat is a key to the foundation of our attempts to improve our use and exploitation of fish resources (Kaiser and Armstrong 2005). Habitat requirements for each stage of a fish’s life cycle (egg, larvae, juvenile, and adult) may also be quite different within the same water body. In areas where fish habitats have been changed or lost by humans, many commercially important fish species have declined in numbers, become extinct, or have been replaced by other species more tolerant of the habitat changes (MacNeill 2010). Different fish species may show different preferences for these diverse habitat units, giving rise to species assemblages (Rose and Echelle 1981; Finger 1982; Capone and Kushlan 1991; Chipps et al. 1994). Freshwater ecosystem and its resources are an indispensable part of human life and activity. As a result of this indispensable nature, the health of those freshwater ecosystems is visible in the wellbeing of the fish assemblages they support (Johnson et al. 2012). The habitat requirements of fish in streams are in many ways similar to those of humans in our own environment. Like humans and all animals, fish need a healthy living space or habitat, to survive, grow, and reproduce. The quality and quantity of fish habitat in a water body directly affect fish populations. The existence of good fish habitat is dependent on a number of factors, such as water flow, water quality, the presence of sufficient food, and the lack of excessive numbers of predators and competitors (Thompson and Larsen 2004). Biological communities vary from season to season and order of streams such as first, second and third order streams, as a result of differences in habitat structure (Gorman and Karr, 1978), resource availability (Grenouillet et al., 2002), and biogeographical patterns (Matthews & Robison, 1998). Knowledge and prediction of community characteristics in response to different environmental factors is one of the main objectives of community ecology. Besides this, knowing on the type of fish and its habitat preferences is an important point. 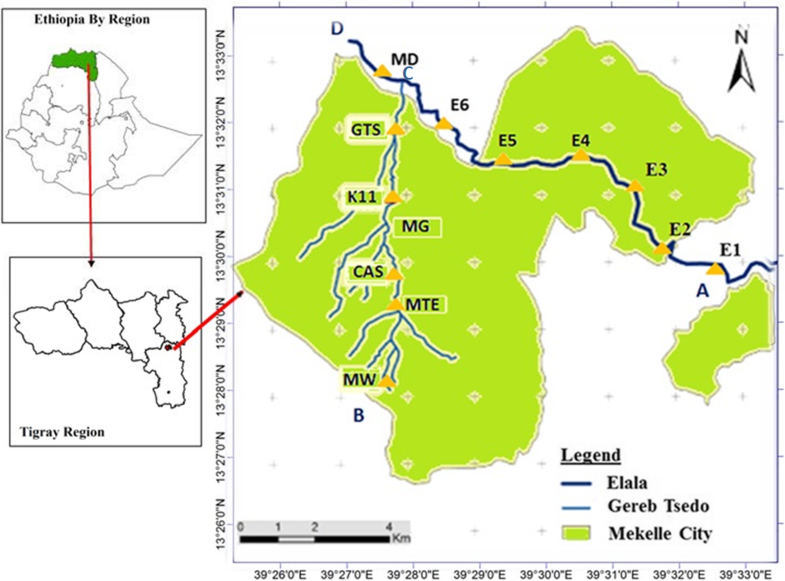 In this study, we tried to describe the community structure of fish in two streams of Mekelle city. The hypothesis was to understand if both streams can support fishes equally in association with their environmental factors. In addition, we tried to study the quantitative measures of microhabitat use and factors associated with the fish habitat presences and the streams nature. As such, this would be a valuable foundation of baseline information with the potential to inform aquatic conservation efforts and to generate hypotheses for future research. Understanding the ecology and stream habitats is of vital importance to ensure better water quality management and conservation activities. Species of the genus Garra inhabit a wide range of substrates (muddy, sandy, and rocky bottoms) in streams, rivers, pools, and lakes. They are primarily freshwater species but are also reported from brackish waters (Getahun 1999). They are also well studied in most reservoirs of Tigray (Mekonen Teferi et al. 2013); however; there is no study of the fish’s ecology and habitat preferences in the streams. Moreover, several studies and reports in Ethiopia focus on the large commercially valuable fishes in large lakes, while the small stream fishes get less attention and there are no studies on habitat preferences. In order to describe the regional stream fish diversity and its habitat preference, it will be necessary to have information on the inadequately studied aquatic systems in the Tekeze sub-basin. So, the present study aims to describe the habitat preference and its availability to fish assemblage, as well as ecology, habitat use, and habitat characteristics in two streams of Mekelle city, Tigray, Ethiopia. The study was conducted in two streams of Mekelle city, namely Elala and Gereb Tsedo. These study areas are located in Mekelle Town (13° 32′ N latitude and 39° 33′ 8″ E longitude) (Fig. 1). Mekelle is the capital city of Tigray National Regional State in northern Ethiopia. Gereb Tsedo and Elala are intermittent streams that pass through the northwestern and southwestern portion of the city, respectively. These two streams join together and make the Mariam Dahan stream. This common stream further continues down to make the Romanat stream (Fig. 1 D). The headwater for Elala is around Aragure, 16 km from Quiha (Fig. 1 A). The second stream (Gereb Tsedo) has different names at different locations of the town. It starts from May Weini complete primary school (Fig. 1 B), then continues to the Catholic and Adventist schools where it is named as May Tsaeda Egam. This stream continues downward on the west side of Abraha Castle passing along the large bridge (May Gifaf, Kebele 11) and then further continues downward and named as Gereb Tsedo. It continues its way with some small tributaries joining it with wastewaters discharged from the town and finally joins Elala stream at Mariam Dahan (Fig. 1 C). Fish specimens were collected in a standardized way using backpack electrofishing by depletion sampling technique (“Zippin” method) (Zippin 1958; Lockwood and Schneider 2000; SFCC 2007) from the two study streams and Mariam Dahan during the third week of August, December 2013, and March 2014. Each stream had six sampling sites before their junction point and a common site after they joined. Sites were marked and located using GPS readings at approximately 1 km maximum and 0.3 km minimum distance between two consecutive sampling sites based on the accessibility and wadable of the streams. The stretch of each sampling site (having three habitats) was approximately 50 to 100 m. The time span for each run was 5 min, and the time gap between the runs was 20 min. Consistent sampling design for each site in each sampling period was applied to avoid biased results (Jha et al. 2005). Samples in a given stream were taken per the planned time for all the study seasons along an identical trajectory, which included all major river microhabitats (pools, runs, and riffles) (Jones et al. 2003; Jayaratne and Surasinghe 2010). From the catches, fish specimens were collected and identified using keys and descriptions (Stiassny and Getahun 2007). Specimens of each species were counted. Five to ten specimens of unidentified species were preserved in buffered formalin (10%) and transported to the laboratory for species validation and confirmation. Monitoring of fish assemblages in wadable streams is principally based on electrofishing methods (Reynolds 1996; Fame Consortium 2005). Before the junction of the two study streams, each stream had 6 sites with 3 habitats each (pools, runs, and riffles) (Jones et al. 2003; Newson and Newson 2000; Parasiewicz 2007; Jayaratne and Surasinghe 2010), and each habitat is with two sampling runs (Jayaratne and Surasinghe 2010; Jones et al. 2003). Downstream of the confluence point, a site with 3 habitats and 2 runs in each habitat was performed. Total sampling sites upstream and downstream of the junction from both streams was 13 (6 sites each stream before joining and one common site downstream). At each sampling site, relevant physicochemical parameters such as stream velocity, water depth, stream width, water temperature, pH, conductivity, and dissolved oxygen were measured using standard techniques (APHA 1998). Stream velocity was measured using the floatation method, by recording the time taken the object to float a specified distance downstream (Gordon et al. 1992). Conductivity, pH, oxygen concentration, and water temperatures were measured in situ from all study sites using conductivity meter (model No: SX713), pH meter (model No: pH -013), and oxygen meter (HQ 40d multimeter), respectively. Moreover, other parameters like water transparency using Snell’s tube (diameter 6 cm) (Sovell et al. 2000; Van de Meutter et al. 2007) and turbidity and chlorophyll a concentrations (as a proxy of phytoplankton biomass) using fluorometer (Turner Aquafluor; model No: 8000-001) readings was measured in the field. Macroinvertebrate field collections were also undertaken along with the fish sampling period 13 sites and 39 microhabitats (Fig. 1). Sampling was done using sediment sampler (ekman grab (0.035 m2) from sediment and D-frame net (0.23 m × 0.23 m, 500 μm net) from the water column along the fish sampling course and were standardized by area (Van de Meutter 2005). Samples were placed in 2-l vials, fixed with 10% formalin and labeled with site and habitat identification. Upon return to the laboratory, all samples were decanted and sieved through a 500-μm sieve. Materials retained on the sieve were sorted and examined under a dissecting microscope (Olympus: SZX 9), and all organisms were removed and placed in labeled glass vials. Samples were later transferred to 70% ethanol and identified. Organisms were identified to family level using Aquatic Invertebrates of South African Rivers field guide (Gerber and Gabriel 2002). In addition, macrophyte cover (%) was checked along the electrofishing areas (fish sampling trajectory in all sites of both streams). It was computed as the ratio of area covered to total area, i.e., by taking the length and mean widths of the stream covered by macrophytes. Shading by riparian trees was estimated as the percentage of the sampling trajectory that had tall trees (> 10 m) within 10 m of the parallel shorelines or stream banks (Van de Meutter 2005). Fish community composition from the catch per unit of effort (CPUE), i.e., individuals/run (King 1991) of each species of overall streams as well as from each separate stream, was analyzed using species abundance and total fish abundance data. Fish species diversity and richness among the three habitat types, as well as between the two streams, was calculated. Species diversity for each site was calculated using the Shannon index of diversity (Shannon and Weaver 1949; Kwak and Peterson 2007). The Shannon index of diversity was calculated as H’ = −Σpi ln (pi), where pi = ni/N; ni is the number of individuals of “ith” species and N = Σni. The indices were used to compare the species distribution, richness, and diversity across the study sites. Species richness was calculated as the total number of species per site or habitat (Magurran 1988). For temporal (season) and habitat differences in fish abundance in the streams, two-way ANOVA was used to check the effect of season, habitat, and their interactions. To test for any systematic differentiation in species abundances of the fish communities between streams, redundancy analysis (RDA) was applied (Lepš and Šmilauer 2003; Legendre and Legendre 2012). To visually explore patterns of associations among habitats, streams, key environmental conditions, and between these variables and variation of fish species abundance and total abundances, principal component analysis (PCA) was used. PCA and RDA analysis were done with CANOCO v4.5 (Peres-Neto et al. 2006). To quantify the relative contribution of key explanatory variables to the explanation of fish community composition, variation partitioning analysis was carried out using partial RDA (Peres-Neto et al. 2006) performed in R v2.8.1 (R Development Core Team 2010). Variation partitioning was used to decompose total fish abundance variation into pure habitat type, stream, and pure environmental component. Furthermore, the amount of variation was estimated and explained by each combination of these variables (i.e., shared variations of habitat type, stream, and environment). During the study, with the exception of G. aethiopica that was found only in two sites of Gereb Tsedo stream, the other species were found to be very widespread: G. blanfordii and G. dembecha were observed in all the 12 study sites in both streams (100%) and G. ignestii in 9 sites (75%) (Table 1). G. blanfordii (overall relative abundance 73.4%) dominated many of the fish communities (Table 2). Although widespread, G. dembecha and G. ignestii were more frequently found at relatively low abundances (Table 1). After two-way ANOVA was applied, only a negligible amount of variation (≤ 1%) in fish community abundances could be explained by season. Furthermore, we found no significant effect of season. In total, 6554 cyprinid fishes were recorded in pool, run, and riffles. The riffles were least occupied habitat by the majority of fishes (i.e., both species wise and fish abundance). The maximum fish diversity and species richness was reported in pool habitat H’ = 0.835 and S = 4, respectively. 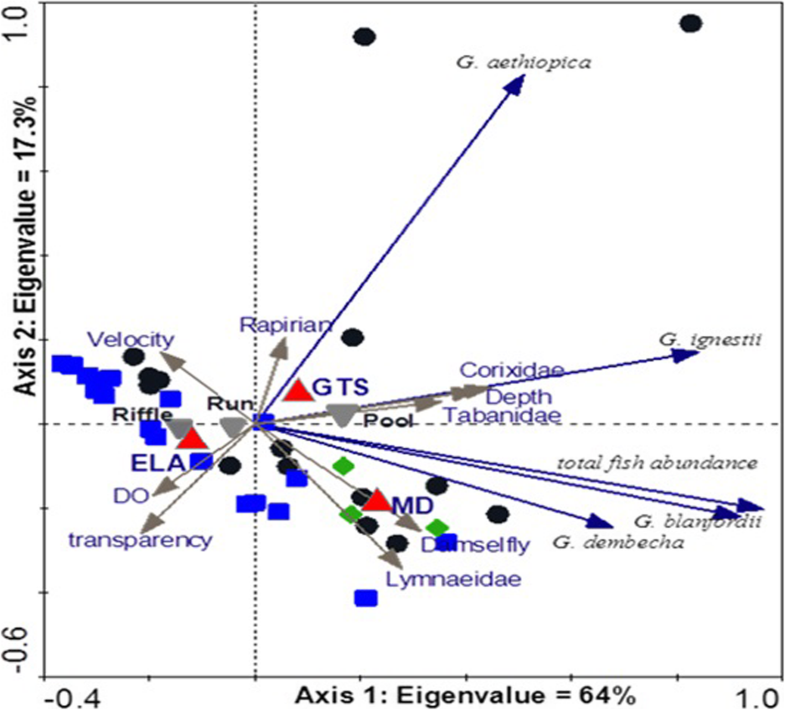 Riffles had significantly lower species richness between the streams than pools or runs (Fig. 2). But pools and runs have the same species richness although pools had a higher total number of species richness summed across all sites (i.e., a higher mean species richness) (Fig. 2, Table 2). In addition, abundance data shows that pools are the most preferred habitat and runs were intermediately preferred (Table 2). The physicochemical variables of the two studied streams and their junction (Table 3) indicate that dissolved oxygen concentration, pH, chlorophyll a, and macrophyte coverage (%) were relatively high in Elala compared to the other two streams. In addition, in Elala stream site, E2 the maximum 14.6 mg/L and, in Gereb Tsedo stream site, GTS a minimum of 1.7 mg/L dissolved oxygen concentration were recorded in December. Site wise, the concentration of the pH varied from 6.3 to 8.13 during the study period. At Gereb Tsedo stream site GTS-Rn (Gereb Tsedo run), a minimum of 6.3 and, at Elala (E1), a maximum of 8.13 were observed. In addition, surface water temperature was varied from12.4 °C to 26.8 °C in Elala, 17 °C to 25.1 °C in Gereb Tsedo, and 19.3 °C to 26.7 °C during the study period. As indicated in Fig. 3, the two axes represent 81% of the total variation in fish community composition in the 12 sites of the two studied streams. The first axis represents 64% of the total amount of variation. This axis is positively associated with the relative abundance of G. blanfordii, G. dembecha, and G. ignestii as well as with the relative total fish abundance. This axis is orthogonal to G. aethiopica. Key environmental variables, such as the macroinvertebrate taxa Corixidae, Tabanidae, damselfly larvae, Lymnaeidae, and riparian cover and water depth were also positively associated with PCA 1. PCA 1 also clearly differentiates among the three habitat types (pool, run, and riffle) and between the two streams, Gereb Tsedo (GTS) and Elala (ELA). PCA 1 is positively associated with pools and negatively associated with riffle habitat types (Fig. 3). Gereb Tsedo stream is positively associated with the macroinvertebrate taxa Corixidae, Tabanidae, damselfly larvae, Lymnaeidae, and water depth. This stream is also strongly positively associated with fish community abundances which are mainly dominated by high abundances of G. blanfordii and moderate abundances of G. ignestii and G. dembecha (see also Table 1). Moreover, Gereb Tsedo is negatively associated with riffle habitat types, water velocity, dissolved oxygen concentration, and water transparency (Fig. 3). In contrast, Elala stream is positively associated with riffle habitat types, water velocity, dissolved oxygen concentration, and water transparency (Fig. 3). This stream mainly consists of riffles with relatively higher water velocity, dissolved oxygen, and transparency with relatively low fish abundance (Fig. 3; Table 2); with less diverse fish communities, containing relatively small fractions of G. blanfordii, G. ignestii, and G. dembecha; and with an occasional sub-dominance of G. blanfordii (see also Table 2). Mariam Dahan stream takes an intermediate position between the conditions of Gereb Tsedo and Elala streams as Mariam Dahan stream is formed from the joining of these two streams (Figs. 1 and 2b). Gereb Tsedo stream is also characterized by lower water transparency in contrast to the relatively higher water transparency of Elala (Fig. 2). The second PCA axis explains 17% of the variation in Garra community abundances (Fig. 3), and to some extent, it was positively associated with riparian cover, Gereb Tsedo stream, and the relative abundances of G. aethiopica in Gereb Tsedo (Fig. 3). This axis was negatively associated with transparency and the macroinvertebrate taxa Lymnaeidae. Among the explanatory (environmental) variables, only a few of them were significantly cause a variation in fish abundance on the study streams (Table 4). The significant variation can be categorized into habitat type, stream type, and key macroinvertebrates. Depth explains 12.6% of the variation and this was one of the characteristics of the habitats which enable us to know the fish habitat preferences as well as abundances and species richness. According to the forward selection procedure, the RDA model with only streams, habitat types, and macroinvertebrates as explanatory variables proved to yield the most parsimonious environmental model. Partial RDA analysis for variation partitioning revealed that numerical abundance of the fish communities was significantly explained by pool habitat types (RDA: R2 = 0.159; P < 0.01), riffle (R2 = 0.118; P < 0.05), stream types Gereb Tsedo (R2 = 0.126; P < 0.01), Elala (R2 = 0.126; P < 0.01), macroinvertebrates Corixidae (R2 = 0.125; P < 0.05), Tabanidae (R2 = 0.120; P < 0.05), damselfly larvae (R2 = 0.074; P < 0.05), and depth (R2 = 0.126; P < 0.01). A global environmental RDA model using R statistical software v.2.8.1 (Oksanen 2005), including the entire set of environmental variables, stream types, and habitat types, demonstrated a significant effect on fish community abundances (R2 adj = 0.68; F-ratio = 4.214; P < 0.001). This was due to the influence of the categorical variables namely streams (Gereb Tsedo, Elala), habitat types (pools, riffles), and macroinvertebrate taxa (Corixidae, Tabanidae, and damselfly larvae). According to variation partitioning, an RDA model based on the streams explained 25% of the variation (P < 0.01). Habitat types explained 29% of the variation (P < 0.01), whereas the effect of key macroinvertebrate taxa accounted for 32% of the variation in fish community composition (P < 0.05). 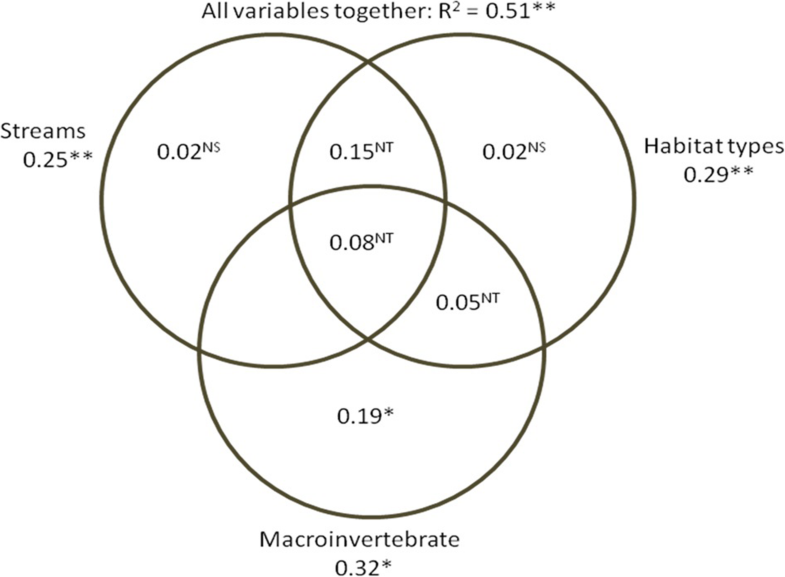 According to variation partitioning, the fractions of variation explained by streams, habitat variables, and key macroinvertebrate taxa were highly confounded and the amount of explained community variation that was shared by the three variable categories amounted to 28% (i.e., 0.15 + 0.08 + 0.05) (Fig. 4), whereas the unique, conditional effects of streams and habitat types became insignificant (Fig. 4). However, the unique effect of macroinvertebrate taxa was significant (R2 = 0.19; P < 0.05) (Fig. 3). The current study showed a total of four fish species categorically identified and obviously belonged to the cyprinid family in both study streams except G. aethiopica, which is localized in only two sites and two habitats of Gereb Tsedo stream. Each species within the habitats interacting with local characteristics determines the fish assemblage structure and their habitat suitability and preferences. Physicochemical parameters and habitat characteristics like water depth, velocity, and river bed width were some of the major factors for the distribution, abundance, and richness of fish species in the different habitats. Similar observations were made by Gorman and Karr (1978), Arunachalam (2000), Johal et al. (2002), and Negi et al. (2007). Total relative fish abundance showed an increasing pattern during December than during August and March, though there were no significant differences in fish abundance among seasons. This might be due to the flow of the water, river bed width, and other environmental factors varied slightly among the seasons. Differences in stream types, habitat types, and food resource (key macroinvertebrate taxa) each explained a significant proportion of the variation in numerical abundance of fishes. Fish abundance strongly differed between streams, among habitat types, as well as along the key macroinvertebrate taxa (Corixidae, Tabanidae, and Damselfly larvae). However, all these three variable categories showed a strong degree of collinearity. In addition, the streams did differ in the abundance of macroinvertebrate taxa, riparian cover, and waste dumping sites. Our result revealed that, among the habitats, pool supports the highest fish abundance which is in agreement with other similar works (Freeman and Marcinek 2006). The large and significant amount of variation explained by habitat type may indicate that habitat use is indeed potentially an important factor determining total fish abundance. Moreover, differences in the availability of key macroinvertebrate insects in the stream habitat types strongly influence the fish abundances between streams and among habitat types. Reports from micro-reservoirs in Tigray showed that the cyprinid fish Garra mainly feed on macroinvertebrates and detritus (Mekonen et al. 2018, in press). Similarly, in other continents, the abundance of cyprinid fishes, e.g., G. cambodgiensis and Schistura breviceps, is reported to be determined by differences in food resource and habitat type (Rainboth 1996; Kottelat 1998; Ward-Campbell et al. 2005). The environmental variables in the current study (such as temperature, pH, and dissolved oxygen) showed relatively weak relationships with fish abundance. For the prediction of fish diversity and abundance, it was found that stream type, habitat type, and the availability of key macroinvertebrate taxa (food resources) were the best predictors for fish abundance and species richness, compared to physicochemical variables. The global models in our variation partitioning analysis explain a large proportion of the variation in total fish abundance (species abundance) and are highly significant. The effects of stream type, habitat type, and the key macroinvertebrate taxa are strongly confounded and cannot be separated, as most of the variation explained by them is shared. Neither the effect of stream type alone (corrected for the effect of habitat type and key macroinvertebrate taxa) nor the effect of habitat type alone (corrected for the effect of stream and key macroinvertebrate taxa) explains a significant part of the variation in fish abundance. Thus, we cannot say that stream type affects fish abundance independently of habitat type and key macroinvertebrate taxa or that habitat type affect fish abundance independently of stream type and key macroinvertebrate taxa. However, we can safely say that key macroinvertebrate taxon affects fish abundance independently of stream type and habitat type. 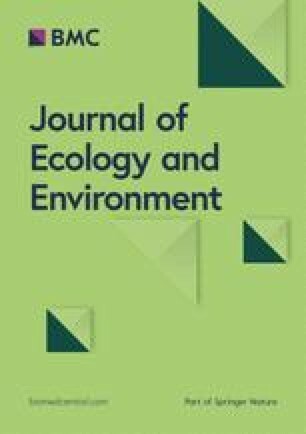 Generally, in this study, the ecological and habitat preferences of Garra fishes showed a significant variation on the species diversity, abundance, and assemblage structures. The results showed that depth and pools are important hydraulic and physical variables for habitat selection by the Garra fish species. Most literatures explain that smaller species tend to occur in shallow water with medium velocities and medium-to-large-sized substrate (e.g., Yu and Lee 2002; Chuang et al. 2006). However, our streams are very small and intermittent with relatively lower depth runs and riffles, which may easily face them to predator attack such as birds. As a result, the species diversity, abundance, and species richness were higher in pools of the study streams and sites. In addition, the relative abundance, species diversity, and richness of freshwater fish in different habitat types of the study streams showed that the pools are the lotic habitats that account the highest mean species richness followed by runs and riffles, respectively. The present study revealed that pools were the most preferable habitat and riffles were the least. This is in agreement with Schlosser (1987) and Meffe and Sheldon (1988) that particularly indicated large-bodied species generally require deeper habitats or pools to avoid avian and terrestrial predators. As observed from the study streams, pool and run habitats were structurally more complex, always deeper than riffles. Thus, they become better habitat availability for fishes than riffles. Riffles were generally structurally simple, shallow, and with low diversity and richness for fishes. Similar observation and assessment were done by Thompson and Larsen (2004). In addition to this, according to Shannon-Weaver diversity index explained by Negi and Negi (2010), pools have greater depths and slower currents than riffles and runs, and along with this, it supports maximum fish diversity. In agreement to this, Harvey and Stewart (1991) reported that minnows (a small freshwater fish of the carp family) survive longer in pools than riffles and runs. However, among the Garra species, G. blanfordii showed a preference of riffles next to pools. The habitat suitability of fishes in the study streams exhibited clear patterns among habitat types and key macroinvertebrate taxa. Among the factors, habitat type was the most important driving factor behind variation among fish abundances. Based on this fish abundance, all pools support the highest fish abundance among the studied habitats of the streams and this might be due to its greatest depth which allows the fish species to get sufficient feed and refuge. Therefore, we recommended that the streams particularly large pools should be protected from excessive pumping for irrigational use and pollution because they can be used as a refuge, feeding and spawning sites of stream fishes. People on the sides of the streams should protect the streams by planting different vegetation, keeping riparian covers and stream bank activities clean, which can be the source of food for fishes and important in improving stream water quality and stability of bank sides. We are most grateful to the MU/CNCS for financial support. We are also thankful to Dr. Tsehaye Asmelash and Dr. Abraha G/kidan for their great cooperation and help. Special thanks to Mr. Belay G/Yohannes, for his help in field work and technical support. This work was funded by College of Natural and Computational Sciences (CNCS), Mekelle University from its recurrent budgets. We declare that whatever data have been used in the manuscript will kept remain intact. These data can be made available to anyone who desires to see them from the corresponding author on request. The corresponding author ST carried out the responsibilities of proposal drafting, data collection, and write up of the manuscript. MT carried out the responsibilities of data analysis and the identifying of fish species. HHT participated in commenting on the proposal and participated in the write-up and commenting of the manuscript. All authors read and approved the final manuscript.